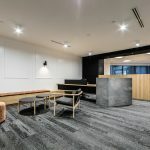 The IA Design team were engaged by Colliers International Project Management on behalf of the Public Service Commission (PSC) to design their new workplace fit out. IA Design were tasked with understanding the many departments and sectors of the PSC to effectively transition from a multi-floor space into one integrated floor to reflect a cohesive organization. This process included IA Design undertaking one on one meetings with each department, a vision workshop and blocking and stacking planning. The key design drivers that were established during the vision workshop were to ensure the new workplace was a representation of the professional PSC workforce and that the environment is sophisticated and timeless whilst still being warm and welcoming. Workplace culture and diversity is a key value for PSC and their new workplace has been designed to be innovative and agile. Multiple elements were incorporated into the design to reflect this value, such as planting throughout to improve air quality, sit to stand workstations and being accessible throughout. Staff enter into a warm and sophisticated reception area and are able to move straight through into the large breakout space that features two kitchens and a variety of seating options. Surrounding these spaces are the offices, workstations and multiple types of meeting space. The end result has exceeded expectations and provided the client with a contemporary and inspirational environment.